The United Nations Relief and Works Agency (UNRWA), which serves Palestinian Arabs who were refugees from the 1948 war, along with their descendants, is responsible for the education of about 25% of Palestinian Arab students in Jerusalem, the West Bank and the Gaza Strip with 96 and 276 schools in those areas, respectively. 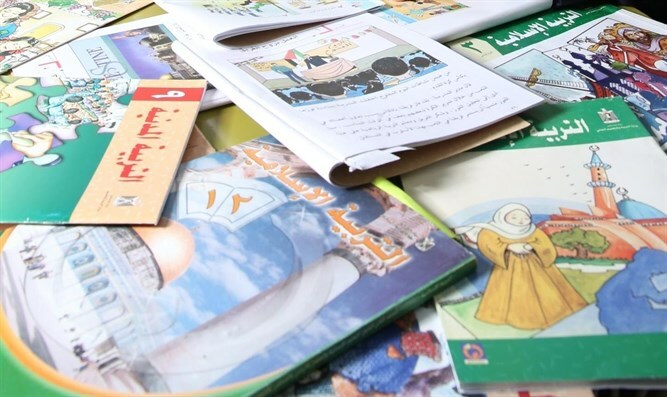 The books used in these schools are published and distributed by the Palestinian Authority (with some books added by the Hamas authorities in Gaza to be used in schools there, including UNRWA schools). PA school books are characterized by three main fundamentals: de-legitimization of Israel and of the Jews’ very presence in the country, demonization of Israel and the Jews, and advocacy of a violent struggle for the liberation of Palestine – including Israel’s pre-1967 territories – instead of advocacy of peace and co-existence with Israel. Within this last fundamental, school children are encouraged to engage in acts of war by way of presenting the violent struggle against Israel as an inevitable necessity, including the violent return of the refugees’ descendants to a liberated pre-67 Palestine, and through the veneration of Jihad, martyrdom and Palestinian individuals who participate in this struggle (called Fidais – those who sacrifice themselves, or martyrs and prisoners-of-war when killed or imprisoned). There are even cases when school children are explicitly encouraged to become ones. The authors of this paper wrote a report in 2015 under the above title presenting the relevant material at that time. 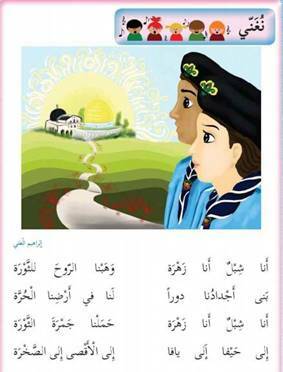 Since the Palestinian Authority started in 2016 a new project of schoolbook publishing, with over 70 books having so far appeared, it was necessary to conduct a new research and write a complementary report based on these new books from which the following examples have been taken. It should be noted that the publishing project of the new schoolbooks is not yet complete and many older books are still in use. 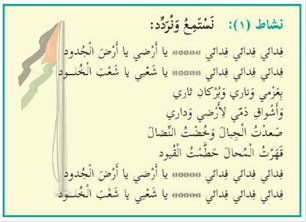 A decisive element in the PA indoctrination in this context is the official anthems of both the Palestinian Authority and its dominant body – the Fatah organization – which are taught to students of the lower grades. Other pieces in the PA school books used by UNRWA present killed terrorists as role models to be followed: Dalal al-Mughrabi, who led the terror attack in 1978 on an Israeli civilian bus on the Coastal Highway, in which thirty five civilians – men, women and children – were murdered, is referred to twice. 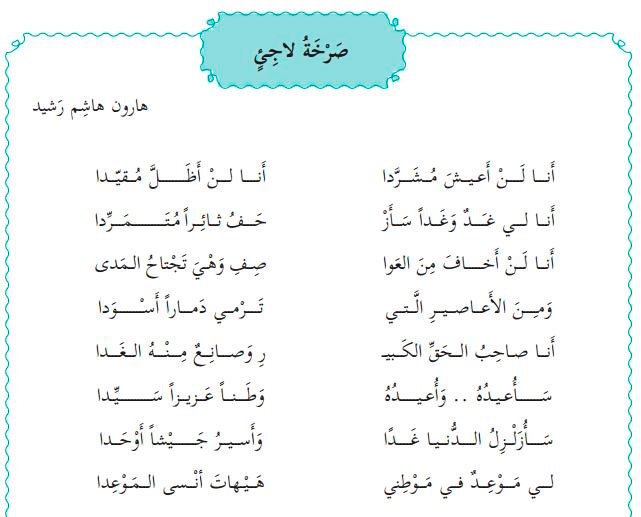 In Arabic Language, Grade 5, Part 1 (2017) p. 14 she is mentioned among the martyrs of Islamic and Arab history of the country. 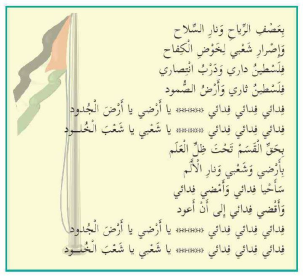 Another piece reads: “Dalal al-Mughrabi who led the Fidai ‘Deir Yassin’ operation on the Palestinian coast in 1978 in which more than thirty soldiers were killed” (Social Studies, Grade 9, Part 1 (2017) p. 74). The violent struggle in which the Palestinian children are encouraged to participate includes the perceived “Right of Return”. This latest incitement is accompanied by a gross description of the victims of the said struggle. A Molotov cocktail attack on an Israeli civilian bus is described as a “barbecue party”. The Attitude to the Jews, to Israel and to Peace, authored by Dr. Arnon Groiss and presented by Dr. Groiss at the UN on September 27, 2017.